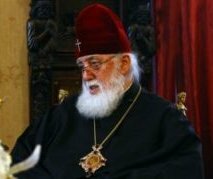 TBILISI, DFWatch–Georgia expects new details to emerge about an alleged assassination attempt in the higher circles of the Orthodox Church, as Patriarch Ilia II has left the hospital in Berlin and is expected to arrive in Tbilisi at around 6pm Monday local time. Details have so far been scarce about the apparent murky murder case, but new information will be released upon the Patriarch’s arrival, First Deputy Prosecutor Giorgi Gabitashvili said in a televised interview with Imedi TV on Friday, without explaining further. It is currently unclear whether the target of the possible poisoning attempt was the Patriarch himself, another person in the higher circles of the Church or a lay person in Ilia II’s surroundings. The Chief Prosecutor’s statement a week ago was taken by many, including members of government, as confirmation that the target of the assassination attempt was the Patriarch, but the PoG later clarified that Ilia II was not the target. PoG’s comments on the issue have been vague, which fuels speculation about the case which has been dubbed ‘the cyanide affair’ by Georgian journalists. Earlier, the PoG said that they are in possession of a lot of evidence in the case, including secret recordings. On Monday, Gabitashvili told the newspaper Kviris Palitra that the amount of cyanide found with archpriest Giorgi Mamaladze was enough to kill several persons.